The reason I decided to attend this conference was due to the various fields it is covering through the 6 days. On Day 2 I had the opportunity to attend Add Intelligence to your solutions with AI, Bots and More. Microsoft’s World View: Microsoft has a new view of Mobile-First + Cloud-first. Microsoft expects 75% of enterprise and ISV development will include AI or ML in at least one product by 2018. Cognitive Systems & AI Revenues Forecast to be $46 Billion in 2020. The view also includes various Agents & Bots, Natural & Conversational user interfaces, Mixed Reality, Artificial Intelligence, Advanced Analytics & workflows and Internet of various things. Data + AI Platform: This includes Microsoft Cognitive Services, Microsoft Bot Framework, Machine Learning – Deep Learning and Infrastructure + Analytics in big data stores. Intelligent Agents: Cortana is a prime example of an intelligent agent. It knows the user, knows about their work + life and knows the world. It currently has over 1000+ skills and knowledge. Presentation Translator: I was very much impressed with the demo of Presentation Translator. Presentation Translator is an Office add-in for PowerPoint that enables presenters to display live, translated subtitles. As you speak, the add-in allows you to display subtitles directly on your PowerPoint presentation in any one of more than 60 supported text languages. Additionally, up to 100 audience members in the room can follow along with the presentation in their own language, and on their own phone, tablet, or computer. If you are interested in downloading the presentation translator please visit the Microsoft Garage: Presentation Translator site. Vision: From faces to feelings,understand images and video. Language: Process text, understand intent. Knowledge: Tap into rich knowledge amassed from the web, academia or your own data. Custom Vision Service: You can upload a few labeled images and the custom vision service will perform the work for you. This is still in preview mode. You can find more information here. Custom Speech Service: Custom Speech Service is a cloud-based service that provides users with the ability to customize speech models for Speech-to-Text transcription. You can find more information here. Language Understanding Intelligent Service (Luis): A machine learning-based service to build natural language into apps, bots, and IoT devices. Quickly create enterprise-ready, custom models that continuously improve. You can find more information here. Custom Decision Service: This service is available in preview mode. As per Microsoft – This new service will help you create intelligent systems with a cloud-based contextual decision-making API that will adapt with experience. You can find more information here. Bing Custom Search: Utilize Bing Custom Search to build a search that fits your needs with powerful ranking, a global-scale search index, and document processing. You can find more information here. Platform Services: Your C# code will integrate these services. Bot Channels: A channel is the connection between the bot framework and communications app. The channels include popular services like Cortana, Facebook messenger, Kik and Slack. Skype and Web Chat are preconfigured for the developers. DevOps: Even though this was not directly related to the session it was a good introduction to the DevOps goals and how to accomplish the continuous value delivery. If you are interested in knowing how Visual Studio TFS assists with this please click here. C# Templates available for download. This requires .NET framework 4.6 or newer. .NET core is not currently supported. Debugging in Azure is made possible with remote debugging. This requires Visual Studio 15.4.x. Dialog – Conversational flow between bot and user. Language generation: Spoken, display strings for the agent. User Experience: Cards on-screen or speech-out for given term in a conversation. Business Logic: Business rules that will help direct conversational flow. In our organization we do have a help desk that serves around 1500 employees. We have a lot of 3 party softwares that are used in our day-to-day business. There are a lot of times when the end-user calls the help desk to resolve minor issues. Sometimes they just email the help desk and the help desk creates a ticket. The ticket is picked up by some help desk technician. The technician in turn goes through their knowledge base articles and either forwards them the article or helps them with following the instructions in the article. This does take time and resource away from the help desk department when they could be assisting with bigger issues in the firm. Our management is also trying to hit a target on how quickly the help desk has been able to resolve the issues. So, if we develop a Bot that is integrated with our Skype for business that would be extremely helpful. The conversation could be started by the end-user and based on the conversation between the user and the Bot the business logic will direct the end-user to the appropriate knowledge base article. If the Bot is unable to resolve the issue then it will open help ticket for the help desk to answer it. In short, it was a great session presented by Brian Randell and it gave me some ideas to explore on. This week I have the opportunity to attend the VS Live Conference Las Vegas 2018 being held at Ballys Las Vegas from March 11th to March 16th. The conference is divided into Pre-Conference Hands-On Labs, Pre-Conference Workshops and Breakout sessions. On Day 1 I had the opportunity to attend “From 0-60 in a day with Xamarin and Xamarin.Forms” presented by Roy Cornelissen & Marcel de Vries. Testing your Xamarin App: Xamarin does allow you to test your apps in the Xamarin Test Cloud. Please refer to https://www.xamarin.com/test-cloud. This link will provide you a list of devices that can be tested. As per the website, there are around 3410 devices on which you can test your app on. Android has around 1551 devices and iOS has around 1859 devices. You can automate your testing. Microsoft has created a framework called Calabash that can automate and test any iOS or Android app, native or hybrid, from the UI level down. You will need to create an account on Visual Studio App Center Test since this is the next generation of Xamarin Test Cloud. Please refer to the Visual Studio App Center for more information. Architecting Mobile Apps: There are multiple approaches that are in place for building mobile apps. Many languages & development environments. Slow Performance. Please refer to a Mobile App Performance Redux for in-depth analysis. Native Performance: Each platform has different way of compiling the apps. Xamarin.iOS: Utilizes full Ahead of Time (AOT) compilation to produce an ARM binary for Apple’s App Store. Xamarin.Android: Takes advantage of Just In Time (JIT) compilation on the Android device. Android – You can download Visual Studio Emulator for Android from this link. In the session, we did face some issues with the emulator not starting. I have blogged on how I fixed the emulator issue on my laptop. But I also did set up my Galaxy S8 to debug the app since the instructors recommended device for debugging the app as an efficient way. You can follow the instructions at https://developer.xamarin.com/guides/android/getting_started/installation/set_up_device_for_development/ to setup your android device for debugging. Xamarin Forms: You can build native UIs for iOS, Android and Windows from a single, shared C# codebase. 40+ Pages, layouts and controls. Native UI from shared code. Application: This provides initialization for the application. Common events that are handled – OnStart, OnSleep and OnResume. Pages: Represents a single screen to display. Shared Projects – with conditional compilation and source code sharing across platforms. .NET Standard Project – .NET standard is a specification of .NET APIs that can be used and are available on all .NET implementations (including Xamarin platform projects like iOS, Android or UWP). It is quite similar to PCL, but it’s easier to use and has more classes available from BCL. If you are interested in knowing whether it is time to move from PCL to .NET standard please refer to this link. Next: Add Intelligence to your solutions with AI, Bots and More. Often we need to debug our SharePoint solution and we are often presented with multiple w3wp processes running and it is really difficult to figure out which process to attach for the debugger. Following is the command that will list all the processes and which web application pool it is using. Open command prompt as administrator and go to the inetsrv folder under C:\Windows\System32. Find your application pool and then you will have the Process ID. 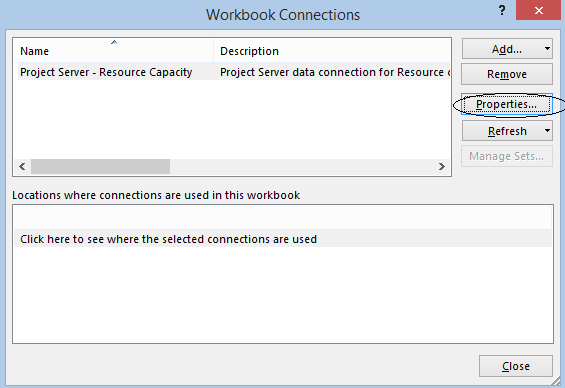 Issue: Recently faced an issue with a client regarding Project Server 2013 Resource Capacity Planning Report. The client had some old projects uploaded and they wanted to view the resource capacity and allocated hours for last few months. They were only able to see information for one last month only. In SharePoint Central Administration, click Application Management. On the Application Management page, in the Service Application section, click Manage Service Applications. 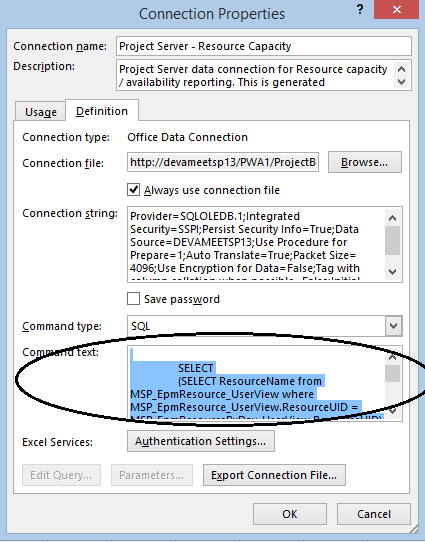 On the Service Applications page, click the Project Application Service that contains the Project Web App instance for which you want to access the Resource Capacity settings. On the Manage Project Web Apps page, click the drop-down menu for the PWA instance for which you want to access the Resource Capacity settings, and click Manage. On the Server Settings page, in the Operational Policies section, click Additional Server Settings. In the Months behind field, enter the number of months in the past that you want resource data to be calculated from. I changed it to 12. In the Months ahead field, enter the number of months in the future that you want resource data to be calculated from. Kept the default to 12. You will have to run the timer job Project Server: Resource Capacity Refresh job for Project Server Service Application for getting the report refreshed with old dates. 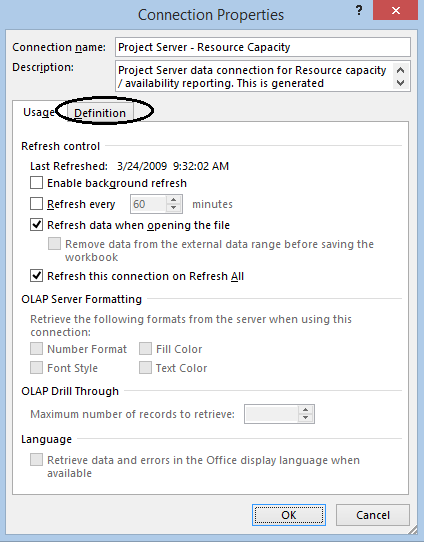 Open the ResourceCapacityPlanning Report in excel. Click on Data -> Connections. On Properties Window click on Definition Tab. Save the file and now your report should pull the appropriate data. If you have ever tried downloading XML form from the Forms library through code you might have realized that the downloaded file is no longer XML. If you try the above code then you will be presented a HTML document but not the actual XML. In order to get around this issue you just need to add the parameter ?NoRedirect=true. What this actually tells the server is not to send the information to the forms server to be formatted. This just downloads the XML as it is. If you try the NoRedirect Parameter on IE then it will ask you where to download the file.